I have been very appreciative of MS Office Communicator and its intuitive integration with Outlook Calendar. Unfortunately when corporate mergers and takeovers occurs often the best product does not necessarily make the cut. That is certainly the case with the loss of Communicator and the emergence of IBM Lotus Sametime Connect. My main issue is obviously no Outlook Calendar support, and then a distant second is the application sharing feature which is a hold over from Windows messenger. To be fair this feature is temperamental on its best day. 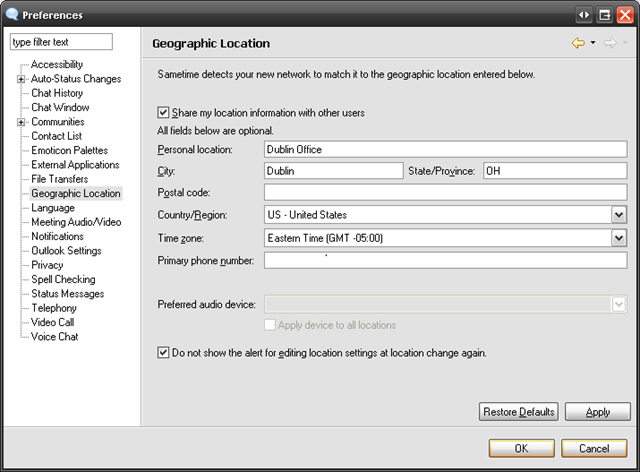 There is one feature of the IBM Lotus Sametime I love and that is 'Geographic Location'. 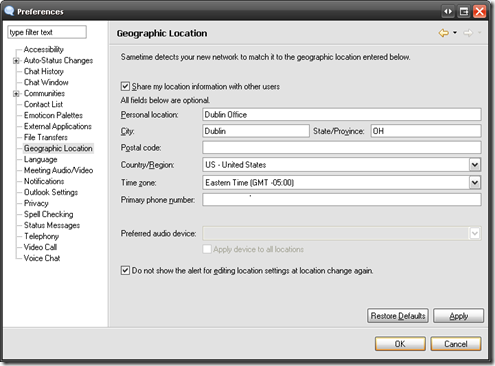 This handy feature is useful because once set, it automatically updates your geographic location, primary phone numbers and even time zone for everyone to see. For groups like mine that are able to work from home, and are distributed across the US, this type of information is invaluable. I think this feature has officially become a glaring omission of Office Communicator.